Each year SCOR awards one RHS senior male and female recipient a scholarship for the participant that best embodies SCOR and who consistently participated in the growth of the program and shared an appreciation of soccer with the focus on fair play and encouragement. To qualify for the SCOR award recipients must be nominated by a non-family member in an email to the President of SCOR detailing why they believe the candidate is the most qualified person for the award. All former SCOR members are eligible to apply. Nominations should be sent to the by April 30th. The SCOR officers (President, Vice President, Treasurer, & Secretary) will select the most qualified recipient for the SCOR scholarships from the nominations submitted each year. Ryan Meegan lived his life to the fullest. One of his greatest passions was the game of soccer which he began playing at the tender age of six at the Soccer Club of Ridgefield (SCOR). Playing on the SCOR Travel team through his U14 season, Ryan brought his enthusiasm for the game and his love for his teammates to every match he played. Along the way, he not only learned how to play the game the right way technically, he learned what it meant to be a good friend and teammate on and off the field. At SCOR, Ryan learned firsthand about working hard, as a team, towards a common goal - his early soccer experiences offered him many opportunities to exert his innate leadership skills which he leveraged as he matured into a young adult. At Ridgefield High School (RHS), Ryan played on the freshman and JV teams that went undefeated. The friendships and comradery developed in those first two years formed the foundation for the success the team would experience in the next two seasons. As a junior, Ryan helped lead the team to its first FCIAC championship in several years. The following year, as a senior, Ryan helped lead the team to it's fourth State championship. As significant and exciting as these accomplishments were, the true value of Ryan's RHS soccer experience was the life lessons he learned about teamwork, dedication, commitment, focus, tenacity, respect and leadership - traits that Ryan exhibited both on and off the field. The SCOR Ryan Meegan Scholarship Fund will be presented to a male and female senior RHS soccer player who best exhibits Ryan's passion for the game, leadership on the field and in the classroom, and respect for teammates, coaches and opponents as determined by the varisty coaches. SWD CJSA offers a scholarship the details of which can be found here, SWD CJSA Scholarship. 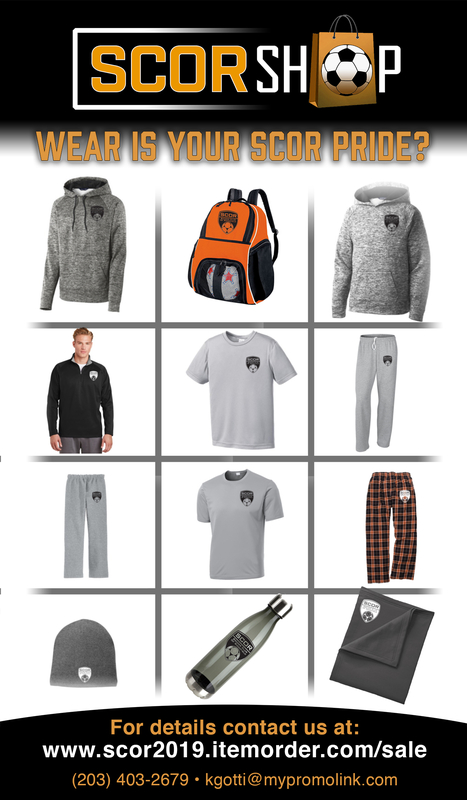 Introducing the grand opening of the online SCOR SHOP!! SCOR SPONSORED SUMMER PROGRAMS REGISTRATION OPEN!!! Register for SCOR Spring 2019 Soccer Season Today! Please note: To maintain acceptable professional coach-to-player ratios, Academy Registration will CLOSE as soon as enrollment reaches capacity. To learn more about the Academy program click here. To view the Academy practice & game schedule and fees click here. This program is the highest level of competitive play representing our club and coached by experienced, professional coaches. Teams practice twice a week with weekend games typically on Sunday afternoons in the greater Fairfield County area. For spring roster placement, players should have participated on a Fall 2018 SCOR travel team. If a player did not play with SCOR in the fall, please contact VP’s of Travel to discuss placement options. Contact the SCOR Registrar about opportunities for Practice Player only positions. * Premier is for U13+ travel teams that have demonstrated and are in need of a higher level of competition. This program provides a competitive environment for High School players in which soccer players are provided the opportunity to develop and prepare for their fall high school soccer season. Teams are coached by experienced, professional coaches and compete in the Southwest District. We thank you for your continued support of the program. We look forward to another season working together to provide the youth in our community a safe and fun environment, in which they can develop a love and appreciation for the game of soccer. We strive to develop them as players and athletes, learn the ideals of good sportsmanship, build character and develop as a responsible citizens of our community. Due to the current weather conditions, fields have been closed for Saturday, April 20th and House games on grass fields are cancelled. Sponsor a SCOR House Team! Put your name or logo on a Jersey! 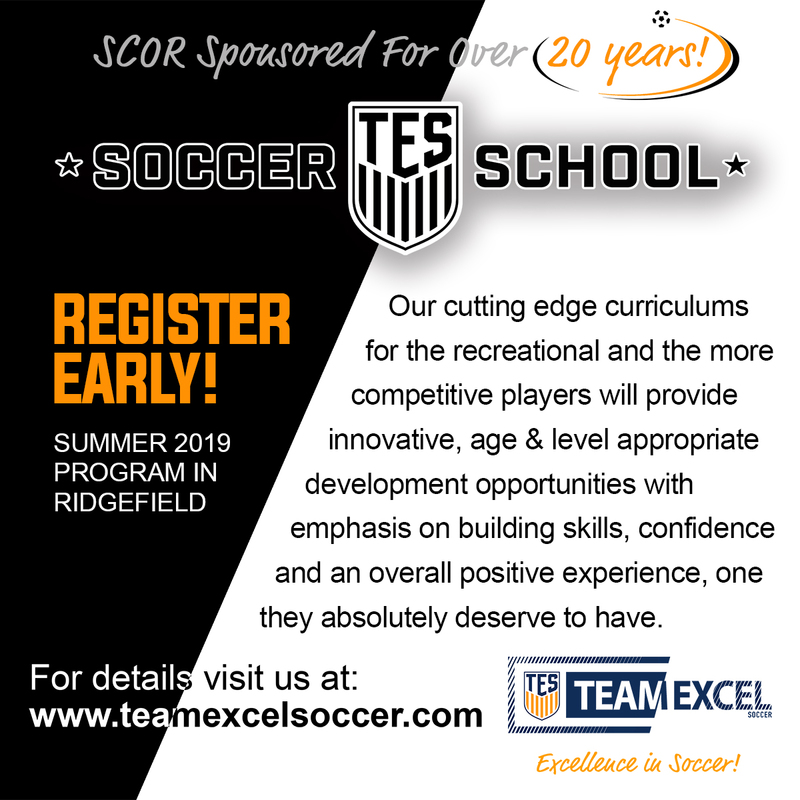 Several levels of sponsorships for SCOR House teams are available to companies or individuals interested in supporting the development of youth soccer in Ridgefield. With a team sponsorship your name or logo will be placed on player jerseys for a SCOR House team grades K through 8. The SCOR is a non-profit organization which is supported totally by membership fees and donations from individuals and local companies. Donate your name and make a difference! Please click here for more information or click here to email us! Be a part of an enthusiastic soccer community on our SCOR Facebook page. Get the latest news from SCOR, share photos of your teams adventures, keep up to date on news and events from the greater global soccer community.